The 1973 restoration and interpretation of Wagaman Mill was a difficult and tedious task. Substantial effort was expended in attempting to recreate the historic facility in as much of its original character as possible. The efforts of many individuals were necessary to accomplish the objective. Space does not permit a complete listing. In order for the project to be implemented, it was necessary that several agreements be negotiated with landowners. Paramount to the success of the entire project was the, complete cooperation of W.H. (Huck) Wagaman, Mary Wagaman, and their daughter, Carol Wagaman Davis, who provided a long-term, 50 year lease to the Wheel House of the Old Mill, and substantial portions of the north and south shore of the North Skunk River. The bridge access area, west of the mill, is included In the agreement, along with the fishing access east of the mill and along the north shore. The former owner of the mill, Larry Melsa, Larry's wife Joyce, and sons Greg and Brad are acknowledged for their cooperation in agreeing to the long-term lease of the Wheel House. Special recognition and appreciation is herein extended to "Huck" Wagaman, who expended many hundreds of hours of personal time in conversation, consultation and direct physical labor in the implementation of the restoration project. Without question, this assistance made the task easier than what it might have been. 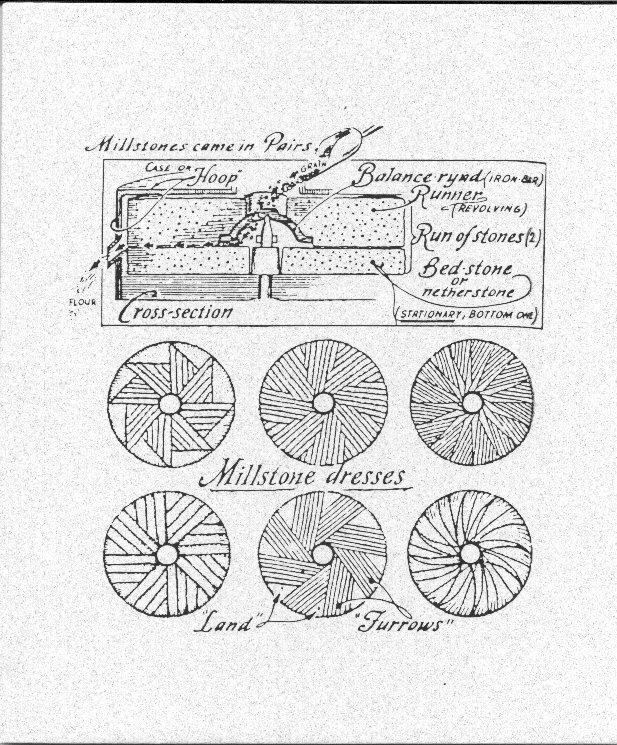 The variety of gears, wheels, shafts, and miscellaneous gadgetry was assembled under "Huck's" direction, based on his recollection of the "Way things used to be." 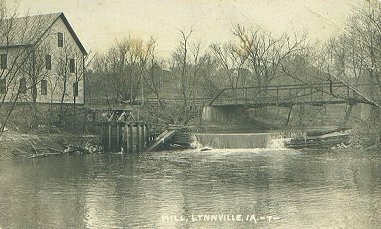 Since 1998, the Lynnville Historical Society has raised money and undertook the repair of the existing mill building. They have also added displays on local history. Last, but not least, the project was only made possible by the financial provisions of the residents of Jasper County, through our local Conservation Fund, and from financial input from the Bureau of Outdoor Recreation, U.S. Dept. of Interior. Without question, a project of this nature is time consuming and expensive to implement. However, it had to be done. The "Old Mill," a unique vestige and remnant of a bygone past--a magnificent reminder of our pioneer heritage, has been preserved for posterity. Prior to the railroads advent in Iowa, small villages were established at suitable locations which would provide a natural site for a mill. Such a site was located by John R. Sparks, who with his family, migrated from Lee County to Jasper County in 1845. The family located in Section 10 of what is now Lynn Grove Township. With a cash capital of $25.00, one span of horses, two yoke of oxen, two yoke of steers and two wagons, John, his wife Elizabeth, and their ten children built one of the first log cabins in Lynn Grove Township. In 1851, John Sparks conveyed the mill and property to Ambrose Osburn, who in turn conveyed the property to Jesse Arnold in 1852. Jesse, along with his son Joseph, operated the mill until his death in 1865. Joseph Arnold then continued the business with his brother, Nathan, until April 12, 1871. The greatest single improvement in the history of the "Old Mill" was accomplished during the ownership by the Arnolds. 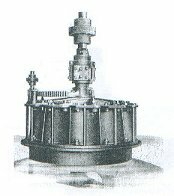 On July 18, 1868, the Arnold Brothers ordered a vertical drive hydraulic turbine from the James Leffel & Co., of Springfield, Ohio. This piece of modem power and milling equipment was shipped on September 17, 1868, and was put in operation at the Arnold Bros. Mill soon after its receipt. This action revolutionized the milling process, eliminating the old, large paddle wheel, and allowing a continuous operation during twelve months of the year. Prior to the advent of the turbine, the mill, by necessity, had to close during the winter months, for the frozen river kept the old wooden paddle wheel from effectively performing its function. During the ensuing years from 1871 to 1898, the Old Mill passed through many hands, namely J.H. Meredith, H. and J. W. Moody, B.F. Arnold, Heston Brothers (H.W. and P.H. Heston), W.W. Dryden, James Fish, David P. Clark, A.W. Lenaberry, and Ezra Craven. On November 25, 1891, Ezra Craven acquired the mill and associated property from A.W. Lenaberry. The building, dam and associated appurtenances were in a tragic state of disrepair, the result of prior years inattention. Substantial effort was directed to upgrading the facility, and Craven managed to create an operation that provided some meager profits. However, due to a minor industrial revolution that was in the offing on a nationwide scale, it was apparent to Craven that modern machinery and equipment were essential to the milling practice. Therefore, on October 21, 1898, Ezra and Susan Craven sold their prized possession to W.K. and Lena Wagaman. With this action, a new era in the operation of the Old Mill on the North Skunk River had been initiated. W.K. Wagaman was no newcomer to the milling trade. He had been a miller for many years in Pella, and taught his sons. Fred and P.D., the operations of this complex and demanding business. Soon after acquiring the mill, Wagaman set about to improve production and quality of the product. Modern flouring machinery was installed, and the fame of "Red Bird" and "White Lion" sifted flour spread across central Iowa. He also milled "Wheat Heart" cereal. 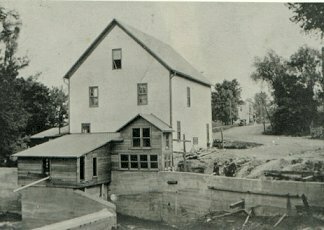 During periods of drought and low water in the mill pond, it was necessary to curb operations at the mill. In order to overcome this problem, W.K. had an auxiliary steam powered engine installed in 1900. This innovation was invaluable during the 21 years it was used. Prior to his passing in 1908, W.K. Wagaman secured the able assistance of his two sons, Fred and P.D. in the operation and management of the "Old Mill." However, in 1906, P.D. moved on. He remained in the milling business, and was killed in a mill accident at Prairie City in 1930. Under Fred's ownership and management, the mill business prospered. Business hit an all-time peak during World War 1. Then, in the Spring of 1918, a devastating flood washed out the old woooen dam, decreasing the efficiency of the total operation, and requiring the uninterrupted use of the steam power machinery. During the war years, it was necessary to acquire government approval for construction acts costing in excess of $l,000. As such, it was not until the winter of 1918-19 that approval was granted, and work commenced on the construction of a concrete dam, concrete flumes and wooden "Wheel House." The function of the Wheel House would be to contain the turbines, line shafts, gears, wheels and various gadgetry of the milling operation. Concurrent with the dam construction, Fred Wagaman ordered another hydraulic metal turbine, this being a "Standard Trump Turbine" from The Trump Mfg. Co. of Springfield, Ohio. 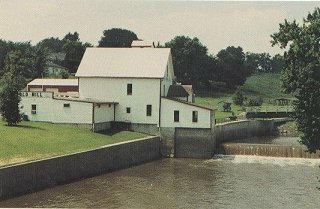 The combined efforts of the old Leffel and Trump turbines were essential to power the extensive machinery in operation at the Old Mill at this time. During the early 1920's, wheat farming in Iowa started to decline. A primary reason for this was the wheat "rust" that virtually eliminated yields of any consequence. Coupled with this was the ease by which one could acquire "factory flour" from any general store. Milling of wheat for flour in small, local roller mills was rapidly passing from the scene of Americana. In 1925, Fred Wagaman altered his operations, and pursued new endeavors of producing animal feed, meal and electric power from the "Old Mill" on the North Skunk. With the acquisition of a 2300 volt generator, Fred was able to produce electricity on a commercial basis. As a substation for Iowa Southern Utilities, the Old Mill produced 5000 to 15,000 kilowatt hours of electricity each month to the surrounding local and rural population. 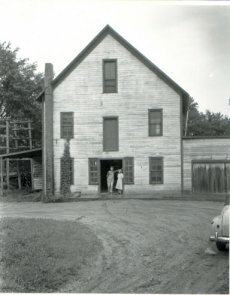 In 1946, Fred's son Harris (Huck) returned from World War II and assumed the responsibility of managing the mill. Huck represents the third generation of his family to operate this historic landmark. Inevitably, electricity was to take over completely the role that for so many years had been played by water power. In 1958, all the belts, shafts, gears and miscellaneous gadgetry were removed by Huck to make way for the modern electrical machinery. Construction of the concrete dam and attached Wheel House, about 1917-18. The old Leffel and Trump turbines were left in the pits, their final apparent resting place. The once deep river that swirled behind the foundation of the Wheel House has long since filled with silt. 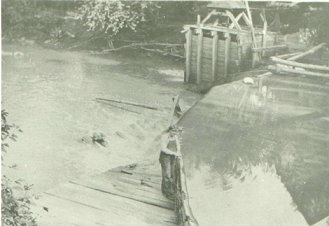 In 1973 the Jasper County Conservation Board assumed the role and responsibility of restoring the Wheel House of the Old Mill to its original operating condition. This action was empowered by means of a long term lease, and was financed with funds derived, from the Jasper County Conservation Fund and the Federal Land and Water Conservation Fund. Preservation of our heritage and a nostalgic interest of things long past directed the Board to ensure the protection and restoration of this unique historic remnant for public use and enjoyment. As one stands in front of the Old Mill, it is easy to turn back the pages of time and visualize the scene of a century ago when this beloved landmark was in its heyday. Right before you is the Old Mill, the dam, the pond and the race which conveys the water to the turbines. It doesn't take too vivid an imagination to mentally reconstruct the rest. One can almost see a line of wagons drawn up in front of the mill walting for service, the horses impatiently stomping, the farmers getting together and talking politics, some wandering off to the general store or the post office. The rumble of the mill machinery and the creaking and groaning of wagon wheels can easily be heard - if one just tries. Although its work is done, the picturesque Old Mill lives on in legend, verse, painting, song, and now in being. 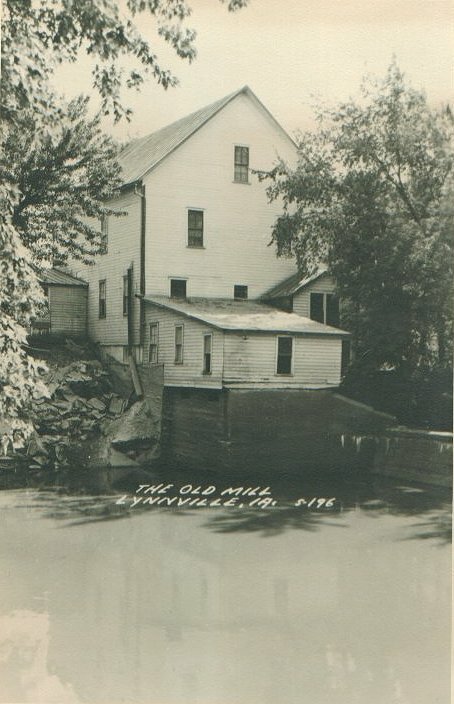 A unique vestige and remnant of a bygone past, the Old Mill is a part of the lamp light era and horse and buggy days. A part of the early American scene. The above illustration is that of a water powered, steel turbine. Specifically, this is a standard "Trump" turbine, called so because of its manufacture by the Trump Mfg. Co., of Springfield, Ohio. 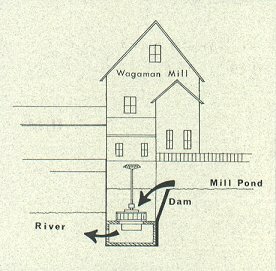 A turbine, exactly as shown, is contained in the Wheel House at the Wagaman Mill, and when activated, produces the power to run the various machinery. This turbine was ordered in March, 1919, from the Trump Mfg. Co., by J.A. (Fred) Wagaman. At the south end of the footbridge, the old, Leffel turbine rests for viewing by the mill visitor. This relic of antiquity was one of the first ever constructed by the James Leffel and Co. of Springfield, Ohio. Specifically, this turbine was ordered by the Arnold Brothers of Lynnville on July 18, 1968, and was shipped by rail on September 17, 1868. 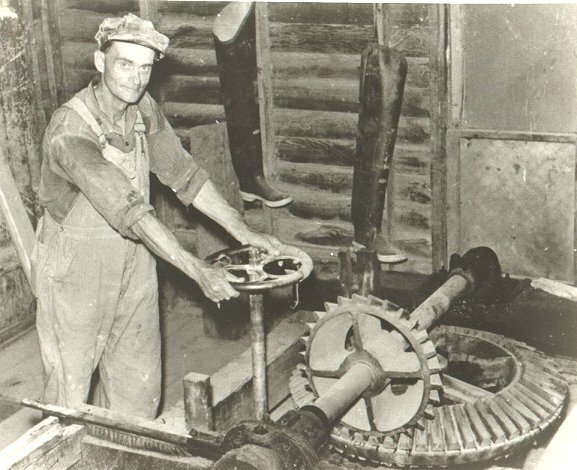 For nearly 80 years this turbine functioned in the "Old Mill" in producing the power for split-wooden wheels and belts to operate the buhr stones in grinding wheat and corn for flour. During periods of low water, an alternate source of power, being steam, was utilized in order to continue production. In 1919, when Fred Wagaman purchased the new Trump turbine, his intention was to utilize both turbines concurrently. This was accomplished, and resulted in a greater power to operate additional equipment. One such piece of equipment was a 371/2 K.W., A.C. Generator. Electrical output of up to 2300 volts served the needs of the residents of Lynnville and surrounding rural area for many years. This generator rests in the "pit" in the Wheel House of the Mill, and functions today as it did for many years. As an item of interest, and for comparative purposes, the 26 inch diameter Trump turbine, the one in operation in the Wheel House today, produces 28.9 horsepower with a seven foot head (depth of water in which turbine rests). At full operation, the turbine would utilize 2,732 cubic feet of water per minute, and provide 134 revolutions per minute of the vertical steel shaft. It is frequently difficult for the mill visitor to properly understand the mechanics of the operation. The above sketch can best illustrate the process. Simply, the function of the dam is to provide a reservoir of water for powering the machinery. Also, very important is the fact that the dam "holds" this reservoir of water at a higher elevation than that of the river below the dam. This difference in water elevation is known as "head." A wooden head gate allows water to flow into the Wheel House and maintain an elevation exactly as that of the mill pond behind the dam. Once this water is in the Wheel House, the only way it can escape to the river below is either through the Trump turbine, resting in the bottom of the pit, or through a tail gate. However, the tail gate is opened only to allow for repairs of equipment or for rapid release of head water. Gates on the turbine are opened by means of a steering wheel, attached to the turbine by a long pipe. Once these gates are open, water is forced through the turbine, forcing the "runner" fins to rotate. The runner is directly attached to the vertical line shaft, which in turn is geared to the horizontal shaft. Again, the "head," generally being 5 to 6 feet, provides the force necessary to turn the runner inside the turbine. Water, manipulating a very simple machine, transfers the energy needed by man to make his task and daily job much easier. The "Old Mill" as viewed by many a traveler leaving Lynnville enroute north. 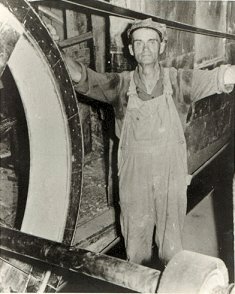 Fred Wagaman in the machinery pit of the Wheel House. This old wooden wheel still transfers the water produced power to machinery in the pit of the Wheel House. The above rendering is an original of December 21, 1918, prepared by the Trump Manufacturing Company of Springfield, Ohio, for J.A. Wagaman of Lynnville. The drawing was prepared for the purpose of identifying the locations of the two turbines, the one in the left being the new Trump turbine, and the one on the right the 1868, old Leffel turbine. Both turbines were arranged so as to work together in the production of power to operate the mill. New vertical and horizontal line shafts were required, as were appurtenances of steel gears with wooden cogs (teeth) and keys (shims). A gear and braking mechanism allowed the Trump turbine to operate independent of the old Leffel turbine. 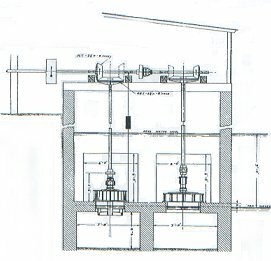 The mechanism illustrated above was that which provided the power for the Old Mill to operate and function. As the turbine gates were manually opened, and water allowed to flow through, the turning runner (blades) were a direct attachment to the vertical line shaft. Power was transferred to the horizontal line shaft from the vertical, and the result was the turning of the split wooden pulleys. Belts from the pulleys were attached to the various machinery in the mill, including grinders, grain cracking equip-ment, separators, sifters, and the 2300 volt generator. Some of this equipment is on display in the Wagaman Mill today. Essentially, the mill mechanically operates today much as it did in history. The difference is that only the Trump turbine rests in its respective pit, while the old Leffel turbine is on display at the south end of the foot bridge. The initial restoration and interpretation of the "Old Mill" was a project sponsored by the Jasper County Conservation Board. Dennis Black, Executive Director, implements the program and policies of the Board. Mark Wagner, Naturalist, is responsible for arranging mill tours and interpretation in the water-powered area of the wheel house. Past, retired Board Members who were actively involved in the restoration include A.L Nuzum, Baxter; Edwin Wilson, Newton; and Dr. T.E. 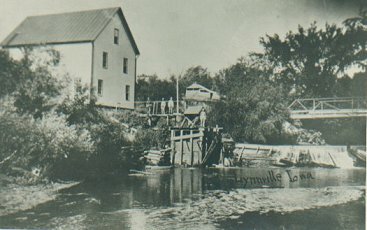 Fitzpatrick, Lynnville. Funds for the restoration of the Old Mill and construction of the associated park were derived from grants-ia-aid under the Federal Land and Water Conservation Fund Program, and monies from the Jasper County Conservation Fund. Current restoration and operation of the Wagaman Mill and Museum is a cooperative effort between the jasper County Conservation Board and the Lynnville Historical Society. Ownership of the Wagaman Mill was deeded to the Lynnville Historical Society by the Wagaman and Melsa Families. The goal of the Jasper County Conservation Board is the establishment of quality park, recreation, conservation and outdoor education system which gives the most service to residents of Jasper County and the State of Iowa. To reach this objective, we energetically promote programs and interests in conservation and the preservation of our natural re-sources. Open every Sunday from Memorial Day until the end of September from 1-4 pm. The Wagaman Mill, also known as the Old Mill, was constructed in 1846. It has been used as a saw mill, carding mill, flour mill, feed mill and as a generating station for electricity. Complete interior restoration and interior interpretation of the wheel house is available for public viewing during the summer only. Placed on the National Register of Historic Places.